Cassandra Goad and Ella Canta have created a stunning altar to celebrate Day of the Dead. The traditional Mexican holiday, also known as Día de los Muertos, is a time to honour deceased loved ones and assist them on their spiritual journey. 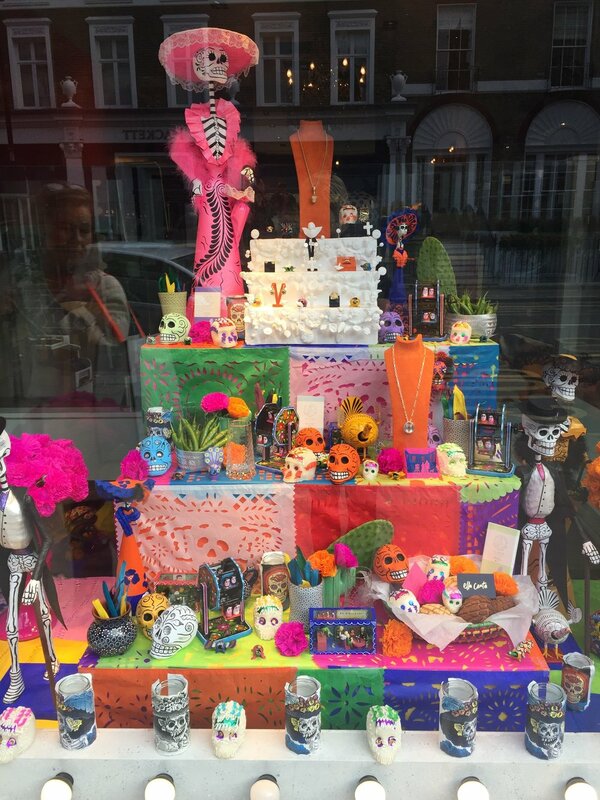 The colourful, ornamental altar, built in the window of the beautiful Sloane Street store, combines some of the exquisite Mexican artefacts and unique ingredients from the Park Lane restaurant, alongside the fine jewellery inspired by magnificent Mexico. The collaboration, which is borne from the mutual love of Mexico of Cassandra and Martha Ortiz, Chef Patron of Ella Canta, celebrates the heritage and vibrancy of the country through elements of Ella Canta. Cassandra Goad’s latest fine jewellery collection Ola Mexicana is inspired by her travels to Martha Ortiz’s magical home country. Having been fascinated by Mexico's colour and vibrancy for years Cassandra decided her love for this country had to be embodied in a collection of jewels. With designs inspired by food, flora and fauna, her gracious jewels dazzle amongst the more traditional altar offerings. Panos de los muertos, chillies, coloured corn husks to cocoa beans, sugar butterflies in bright colours and Wheels of Life from Ella Canta accompany Catrina’s and Skulls. In Ella Canta to mark the holiday, Martha has crafted an eight-course Painted Black tasting menu with accompanying serves; the perfect opportunity to gather friends and family and celebrate life at Ella Canta. Available from 1–17 November, the Painted Black menu has a continuous river of black running through each dish, a line that celebrates life.